The MTC 4000 is a wireless collaboration unit that allows multiple devices to share their screen wirelessly. The base unit connects to the projector or flat panel display via HDMI. Presentation setup is easy and simple. Presentation connection is done via PC application or a USB button. Up to 16 users can be connected simultaneously. The MTC-4000 supports IOS, MAC, Android and Windows operating systems. 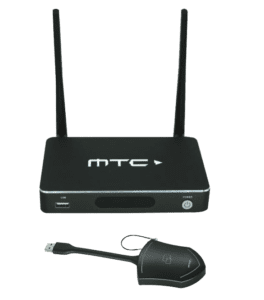 Virtually any device can connect to the MTC-4000 wirelessly. If you wanting to add an interactive board as your display, the MTC-4000 also supports wireless touch. With any wireless solution you need redundancy so the MTC-4000 has a HDMI input for external sources. Brett is a sales executive at AVC and has worked in the AV industry for the last 2 years.